A friend made these for our Christmas Enrichment Night and I've been wanting to make them ever since because they were deliciously pepperminty (no fake peppermint essence here, Candy Canes all the way!) This recipe will be great if you have left over candy canes after Christmas. The recipe is from Crisco. They used red, white and green candy canes which looked really festive, so if you can, use those. 1. Heat oven to 350ºF/175ºC. 2. Beat shortening, brown sugar, granulated sugar, milk and vanilla in large bowl of electric mixer on medium speed until well blended. Beat in egg. 3. Combine flour, baking soda and salt. Mix into shortening mixture at low speed just until blended. Stir in crushed candy. Shape into 1-inch balls. Place 2 inches apart on ungreased baking sheet. 4. Bake 8-10 minutes or until lightly browned. Do not overbake. Immediately sprinkle with about ¼ teaspoon crushed candy. Cool 2 minutes. Remove to rack to cool completely. 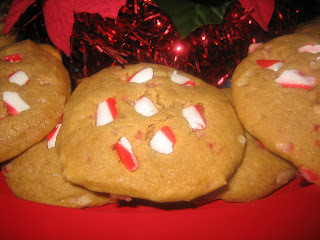 Tip: A 6-oz package of 12 candy canes will make enough crushed candy for the cookies and the garnish. 1. Heat a few canes at a time in the microwave on high for 25 seconds. *Careful, when they come out they will be hot. * Try and work quickly with the warm canes it's a lot easier than cooled hard canes. 2. Put them in a teatowel and beat with the end of a rolling pin. Below is a picture of half beaten canes. At this point I just crushed them with my fingers. Easy! 3. 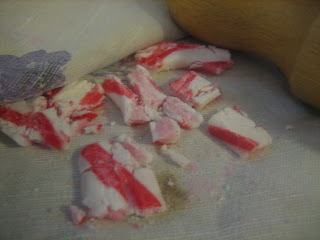 You could also use scissors to cut half beaten canes (while still warm) into little tiny pieces. 4. Crushed canes. 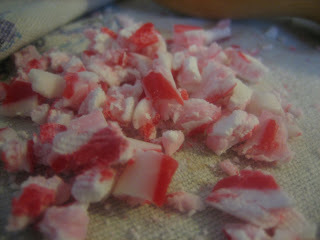 The last batch of candy canes I warmed up just crushed straight away, no scissors or fingers needed. Too easy!! I'm sending these cookies into the Eat Christmas Cookies, Season 2 Event. Check out the Round-up page to see all the Christmas cookies people have sent in. I love those! They're so cute and festive! 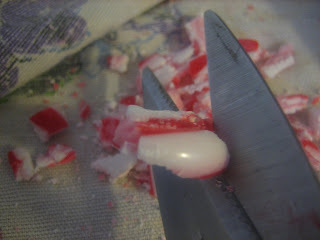 Very cool tips for crushing the candy canes! And these are such festive cookies for the event. Thanks a bunch for the entry. 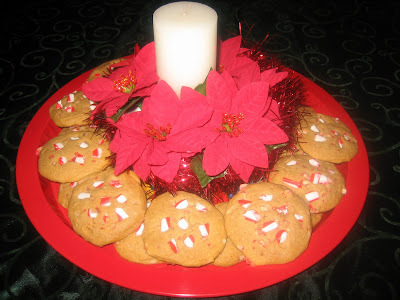 These cookies are perfect for the holidays!! Good idea to use up candy canes.. I dont like them hanging around in our house.. my kids make such sticky messes with them.. eewwwww!! I dont think i would even need to heat them.. they wilt in our hot house just hanging on the tree!! !